First Pic of new game, Akrotiri pops up! 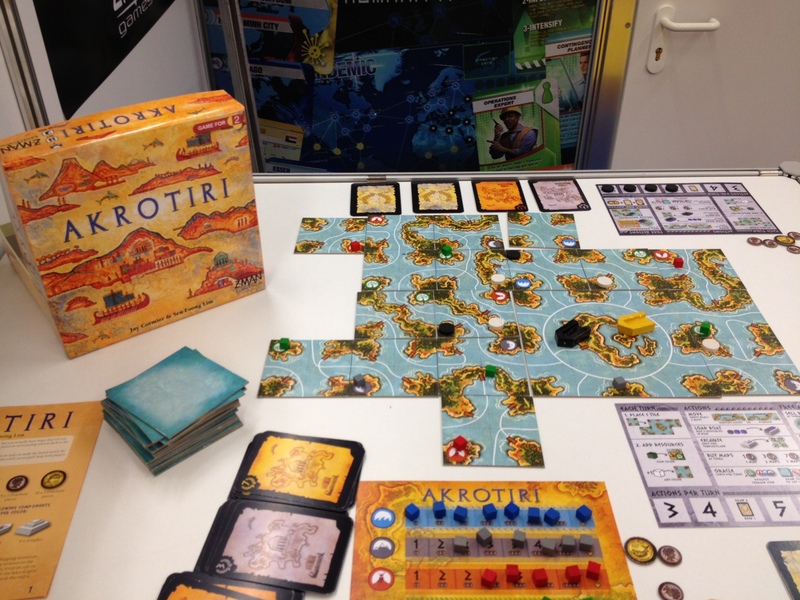 Akrotiri is another game coming from Sen and I this year, published by Z-Man Games. This is one of my favourite designs I’ve ever been a part of as it has tile laying (which I love!) as well as a pretty novel mechanic that I haven’t seen in another game. In Akrotiri, 2 players face off against each other, placing tiles and resources down and using their ship to deliver those resources back to the main island of Thera. The money raised is used to help fund the excavations of temples – this is where the interesting mechanic comes in! Each player has Map cards that they keep secret that indicate the location of a hidden temple somewhere on the board. “But the board is made up of tiles!” I hear you cry. Yes – and we found a way to have temples hidden on the board along with maps to help players find them – even though it’s a tile laying game and the board is different every single time you play it! I can’t wait for you all to get your hands on this one! Expect the game this summer – but in the meantime, check out this picture taken by W. Eric Martin while he was in Nuremberg at the board game convention! Tortuga hits another Stretch Goal! Wow – Tortuga has hit $20,000 already and it still has 2 more weeks left in the campaign. 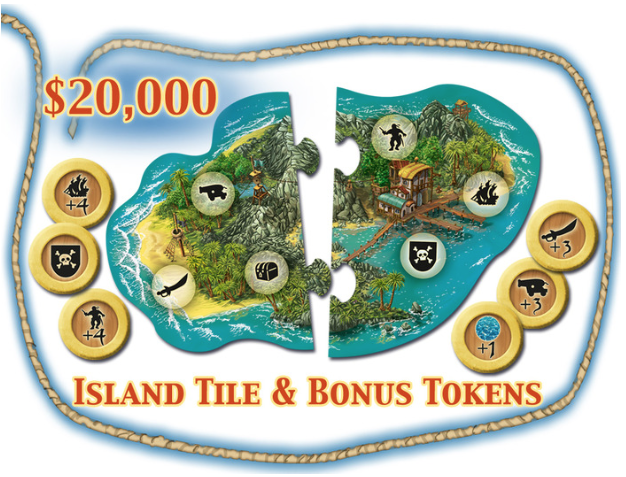 The $20,000 stretch goal was for a brand new island to play with in the game. When you start each game, you choose which island you want to play with as each island offers different play styles and motivations. These stretch goals will NOT be included in the retail box version of the game – so this is the easiest and one of the only ways to get these extra goodies! Queen will be announcing the next stretch goal soon – hopefully today! While all the Early Bird deals are sold out, they did announce a new level called the Sea Dog – which is only $2 more than the Early Bird and still $9 less than full price! But they are limited too and a the time of this writing there were only 102 of those left, so if you’re interested please hurry! New Microgame being published by TMG is now available as a Print and Play! If you want to share any comments or thoughts on the game after playing it – please let me know ASAP as we could use that in our campaign – especially if you belong to some sort of board game review site or something!! Print and Play of This Town Ain’t Big Enough for the 2-4 Of Us. We have a couple of mini-expansions that will be stretch goals for the campaign – but they aren’t included in the Print and Play. Feel free to message me and I can email you the expansions as well for you to try out. First video review of Belfort: The Expansion Expansion! And here’s Let’s Level Up’s review of the base game of Belfort – which he also liked! Here’s another Guest Post for our series, What’s Your Story. This one covers his experiences with blind play testing. It’s an amazing story about taking blind play testing to the max! 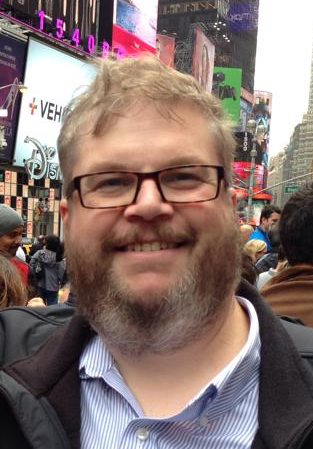 If you have questions for Jeff, post them below and we’ll make sure he answers them! My first question Jeff is – how did you find so many people to agree to blind play test your game?! As an introduction, I’m just going to say that I’d been working on a prototype board game called Knight’s Quest for many months now, and have play-tested it several times with my regular group of close friends and game-pals. Recently, I had the daunting opportunity to invite people from outside my close circle of gaming friends to come out and try my game. I won’t make excuses in this post, but this play test came at a very busy point in my work life (much weekend and evening overtime to launch a large project at work). With much help from my friend Kyle, we rented a community hall for part of the afternoon and the evening of our blind play-test. We invited a total of 28 people to come join us in trying out the board game, with a session of 10 players in the afternoon and 14 players in the evening. Kyle, Corey (my design co-pilot) and I were there to facilitate, answer questions and referee. At this point I want to digress briefly. I’ve played a lot of games. I’ve liked board games and gaming since my teen years. I have played a long list of games (that I won’t go into here) but I’ve never had someone from outside my close circle of friends playing a game I worked on or designed. This was brand new territory for me, and to be honest, prior to the actual day of the event, I was quite nervous about the whole experience. Stage-fright shouldn’t have been a big issue, and the results of this play test session proved that. Kyle and I had arrived to the community hall early and started setting up the game tables so that they would be ready for the players to begin. We had 3 rooms on 3 levels, and ended up with 1 active table on each of the three levels. I gave a preamble speech to the players, thanking them for their time on a Saturday afternoon, and basically setting them free to experience the game with the sole help of the rulebook, quick start guide, and reference page I’d provided everyone. Then I sat back, tied my own hands, and watched the various players attempt to decipher my rules and get their game started. I was hit by an avalanche of learning from the minute this began. Some rules that were very clear in my own (biased) mind were not as intuitive as I’d hoped. Assumptions I had made (biased) about how gamers would treat game components and rules that (I thought) were explicitly laid out, were being interpreted three different ways at three different tables. It was chaos – beautiful, beautiful, educational chaos. I tried very hard not to jump in and advise or help until the players had had a chance to talk things over inside their groups, and only when it seemed like an insurmountable hurdle had come up to block their path toward a successful (and fun) play-test of the game. If players came to an agreed upon solution to any fogginess in the rules, I simply sat back and watched how that interpretation played out. I learned that even with a fair bit of technical writing experience under my belt, and years of publishing technical help guides as part of an IT career, talking about game stuff with people of different levels of gaming experience was a whole new sport. I was going to have to go back to the beginning and re-identify all the unspoken assumptions and hidden pieces of brain-trust that hadn’t been successfully translated into my rules. I was going to have to unpack them carefully, and then reassemble them in language that a non-gamer, non-me person could easily pick up and understand. In short, the experience was awesome! (I mean that.) I know it sounds a little strange to be so excited about a moment when hard work and carefully crafted rules didn’t seem to line up into a perfectly successful play-test of the game the way I thought I had designed and described it to be played, so bear with me for a moment. Quite a few of the people who came out to this were associates and contacts who were not really board game enthusiasts, so I was expecting a bit of a learning curve right off the bat. Some of them were avid gamers, however, and they were the most inventive in trying to find ways to make the game work for them. I was taking notes furiously, both mental and hand-written, to capture any of the bumps, hurdles and blockages encountered by this group. The whole time, Kyle, Corey and I were asking people if they were having fun, and trying to encourage a social fun aspect to the event. All of the groups, with only a few gentle nudges in the right direction, managed to get several rounds of play-test under their belt, and were beginning to develop a feel for the play of the game. About a half an hour prior to our first session ending in the community hall, we had the groups pack up the game and fill out a questionnaire about their time play testing. Kyle and I had populated the questionnaire with some specific questions about mechanics, and room for some open ended questions and free-form comments from the players. To my astonishment (and gratitude) two of the players from the morning session decided to come back to the evening session for a second try at the game. To me this was a sign that I was on the right track to a fun and enjoyable gaming experience. When the afternoon session was finished, we hurriedly packed up and vacated the community hall for another group’s use, and went off to find a way to kill the time in between the early afternoon session and the evening session. Having learned a little bit from the morning session and the learning curve involved with getting the game up and running without guidance, I decided to change my preamble speech and provide a 1-turn demonstration of play so that the players could get a look at how the intended play of the first turn would look. This seemed to get the groups up and running much quicker than the morning session, and resulted in fewer over-all questions about the game, which I believe was a win for myself, the developer. Again, the learning started flowing in almost immediately. There was different learning this time, as the evening crowd had more people with gaming experience in the mix. And we had the 2 returnees from the morning session who had freshly learned how to play the game that day, and may have come in with new strategies to try, or new things they wanted out of the game. Because about 1/3 of the evening session included some people from inside my immediate gaming circle, it seemed like a very sociable event. People were chatting and joking around with one another, and everyone seemed to be having a ton of fun. We had the hall booked for 3 hours again, and allowed the evening session to run for almost 4 ½ hours as there were no other clients waiting for the space. Again, at the end of this session, we had people fill out the questionnaire, and I thanked them all for their time on a Saturday night. When it was over, I was exhausted. I was happy – but exhausted. It had been a super long day, but a super fun day too. My game had been reasonably well received by people I know, and some I didn’t, and today, two days later, I feel extremely optimistic that the feedback provided and the observations about rules interpretation will greatly help me tune this game into something totally awesome! If I hadn’t been so incredibly busy with my work leading up to this play-test, I would like to have taken one more very close pass on the rules prior to the event. I would probably re-order the questionnaire so that the specific mechanics questions came first, and the general impressions questions were last – just so the most immediate feedback might cover some of the specifically complex or troubling mechanics that needed addressing. I would have the play test in one continuous session over the course of an afternoon, rather than breaking it into two separate and time-limited blocks, and would probably do it in a residence rather than a public building – just to save a couple of dollars. Other than those notes, I think that, for me, the play test was extremely successful. I couldn’t wait to start crunching the data and tuning up the rules to make a fun game even more fun and accessible to everyone. The feedback I received from the players was instrumental in helping me tune my design further. In my work-life we operate under an iterative methodology. In my school career, my work was subject to many critiques and subsequent iterations to improve the end product. Applying this methodology to my game design seemed like a no-brainer. Probably the most important parts of this feedback was understanding when rules I’d carefully written out in the rulebook were not being interpreted as I understood them. Also important was finding out some unasked questions that I hadn’t considered or answered because I was so close to the project that they weren’t questions for me. Aside from some minor mechanics tweaks that came out of various feedback, the biggest change to the game after this was to really take a long close look at the rules and ensure that there were plenty of diagrams accompanying explanations of how the game was supposed to function. Blind Play-testing sounds a bit imposing, but I now consider it a primary and integral part of any other design I’m working on. I also received some general feedback about the game being fun, or the theme being nice and that sort of thing, but I try to focus most on the comments that surround making the game play better, and making it easier to understand. I fully expect that if a Publisher accepts the game into their portfolio that there will be artistic changes and tweaking – particularly since my prototypes generally have clip-art or basic diagrams for many of the printed components. Blind Play-testing can be tough for a designer – and especially tough for a designer who has never experienced a critique or iterative project. To set one up on the scale that we did for Knight’s Quest, you have to have some organizational skill, a budget of some kind (if you’re using public facilities), a way to find and invite people to your play-test sessions, and a way to solicit feedback that is meaningful. Then you have to have the patience and forbearance to either let the play-test take place without you, or to keep yourself from influencing it by interfering with the play-test groups. Finally, you have to do something with the feedback. The first few parts can be pretty straightforward. Invite a bunch of people you know peripherally, or don’t know at all to your event. Bribe them with Pizza and soft-drinks if you like. Let them play your game and fill out preplanned comment cards or questionnaires about it. The best part comes afterwards, when you analyze and react to the feedback. You can play-test all you like, but if you never evaluate feedback and use it to inspire positive change to your game, you’re probably just wasting your time. It took me several weeks to go through all the feedback and determine what was useful feedback, what was “fluff” and what feedback could be discarded – and I did discard some suggestions. Overall the experience was positive for me. And I think it strengthened both my rule-writing skills and the game design itself. I would do this again for all of my game designs. However I would caution any designer who is planning a blind play test that the comments are going to range from friendly to not, and treating them critically is going to require some critique-management skills. Good luck if you organize something like this, and I hope all of your feedback is constructive! I also want to thank my good friend Kyle (a co-owner of www.willworkforgames.com) for his work and dedication in helping to arrange and organize this event. Without his encouragement (and pushing) it may have taken much longer for me to get a play test off the ground. 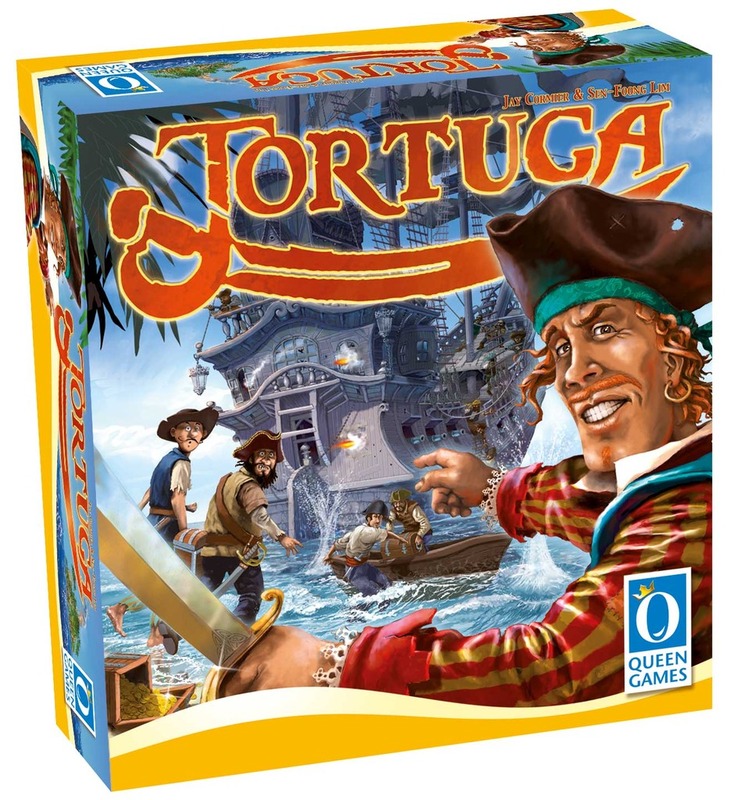 Jay and Sen’s new game, Tortuga, is live on Kickstarter! This is exciting! Our new game, Tortuga from Queen Games is currently live on Kickstarter! We knew it was coming near the end of January – and well, here it is! We’re super stoked for this game and we can’t wait for you to get your hands on this one. It has dice rolling but players all roll simultaneously! Then players assign dice to one of 5 actions in an attempt to find or steal the most treasure from each other or the island of Tortuga. We’ll be posting updates throughout the rest of the 19 day campaign – and we do have more stretch goals figured out – two stay tuned! If you would like to support the game – we’d love you forever – and you can do so by visiting the Tortuga Kickstarter page. Thank you! 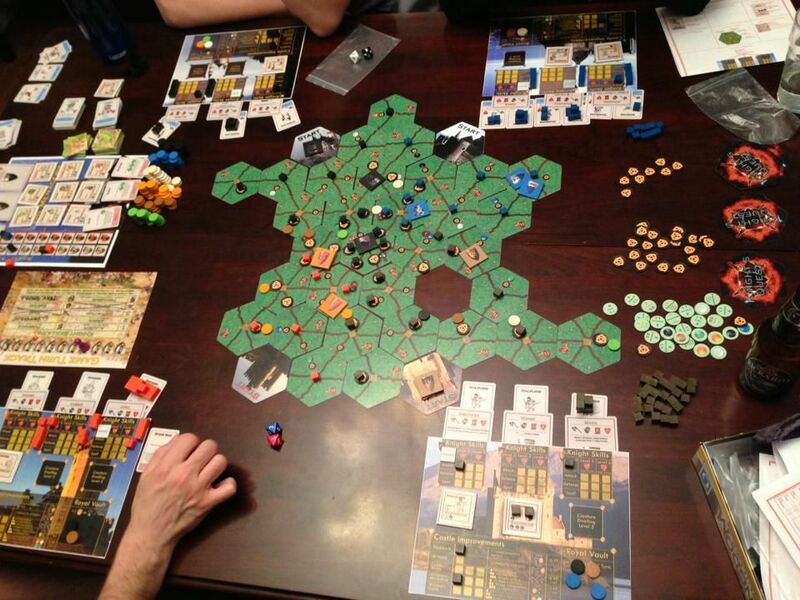 Well we have our first review of Belfort: The Expansion Expansion and it’s amazing! Mark O’Reilly, who was the first to post some comments on boardgamegeek.com, has been the first to also post a full review of the expansion. We’re so ecstatic that he loves it so much!! Very exciting to read! You can check it out here. 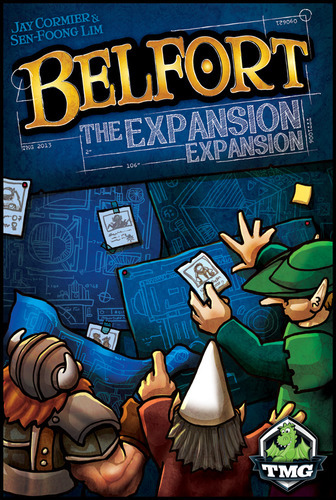 Mark O’Reilly’s review of Belfort: The Expansion Expansion. Not only adds loads of goodiness to an already great game, it elevates the game to top shelf stuff. Tons of variety now, extra guilds, the personnel are simply awesome – and compensate player order ( last pick first) , expansions to the base game buildings of Belfort city are simply genius!, adds a plethora of things to do. Your cup will runneth over :-). Best expansion I have ever purchased to date, adds to game in such a good way. Thank you designers, artist and TMG. Thanks so much for the kind words Mark! Really cool to read that you liked it. We want your board game design stories! Welcome to 2014! We’ve been working at designing board games for over 6 years now, and we’ve been writing about how to get published on this site for over 3 years. The goal of this site was to be very transparent and show people how we came to get our board games published. At the time we only had Belfort and Train of Thought being published but now we have six more games coming out this year! While we still have stories and lessons left to tell as we continue to learn new things about getting published, what we’d love to do now is to hear from other designers. We’re introducing a new segment on our blog called: What’s Your Story? any story about the design process?